Suite Sports: What's Next for HBO After Donaire's Defeat? What's Next for HBO After Donaire's Defeat? SuiteSports would like to welcome our new boxing contributor Warren Rodriguez. In his first piece, Rodriguez takes a look at rising star Nonito Donaire's first loss in over a decade, along with the impact of the fight on the future of HBO boxing and the sport as a whole. Saturday night was supposed to be another stepping stone for the legend that was becoming Nonito Donaire. The 2012 fighter of the year, nicknamed the "Filipino Flash," was on his way to becoming the heir to Manny Pacquiao, knocking opponents out in spectacular fashion and leaving people wondering who was left for him at 122 lbs. In steps Guillermo Rigondeaux, a Cuban defect and two-time Olympic gold medalist who reportedly has over 400 amateur fights under his belt. Rigondeaux was more than ready for the challenge. The fight, which was a unification bout for the WBO and WBA Super Bantamweight titles, took place in New York City at Radio City Music Hall. It would be only the 2nd time in the venue's long history that it had been home for a night of boxing. So, what better stage than this for these two performers to showcase their skills and display their unique talents. The more than 6,000 in attendance came to see Donaire show off his punching power and become the undisputed champion at 122 lbs. Rigondeaux had other plans for the night however. From the first bell Rigondeaux displayed his ring generalship and dictated the fight. It was obvious Donaire hadn’t seen anything like Rigondeaux and quickly became frustrated with the Cuban's speed and counterpunching ability. Rigondeaux kept Donaire on the outside and effectively hit him with jabs and straights every time he tried to close in. Rigondeaux had Donaire circling him all night with no real game plan it seemed, other than trying to catch him with one punch that would end it all. Donaire finally broke through early in the 10th round, catching Rigondeaux with a solid left that would send him to the canvas. Rigondeaux was able to overcome the knockdown, however, and continue his game plan en route to a decisive unanimous decision victory, handing Donaire his first loss in over 12 years. The loss is expected to send Donaire into a short hiatus as he is scheduled to have surgery on his shoulder and spend time with his wife in anticipation of the couple’s first child. Donaire was always expected to jump up in weight and return to the ring in the featherweight division, seeing as he had trouble making weight for the fight and has hinted at moving up a class. The loss could prove to be a short term blow for HBO, as Donaire is arguably the networks biggest star and HBO is refusing to do business with Golden Boy (The brainchild of former world champion Oscar De La Hoya and boxing’s biggest promotional company today). Rigondeaux, though extremely talented, doesn’t have the charisma or boxing style to bring in new fans and keep sustained interest in the lighter divisions. HBO still has some of the best pound for pound fighters in its stable, including middleweight king Sergio Martinez who is making his return to the ring April 27th. 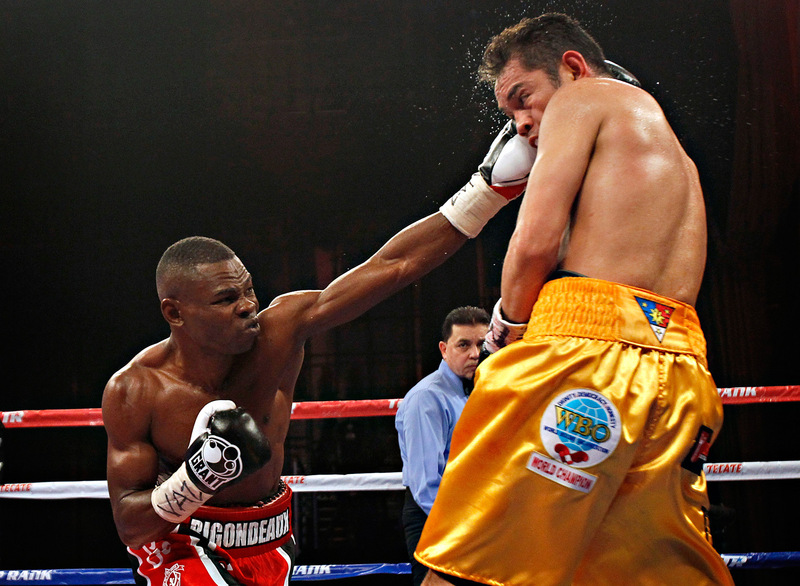 For now though the night belongs to Guillermo “Always Ready” Rigondeaux.